News » A Flurry of Positive Updates Contribute to Bullish Expectations for Globex Mining Enterprises Inc.
A Flurry of Positive Updates Contribute to Bullish Expectations for Globex Mining Enterprises Inc. The nature of the relationship with Renforth Resources Inc. has continued to evolve since Globex Mining Enterprises Inc. (CA: GMX – $0.33 & US: GLBXF – $0.24 & GER: G1MN – €0.20) agreed to an option deal for its Parbec Gold Property in February, 2015. Under the original terms of this arrangement, Renforth could earn 100% ownership of the property by paying a total of $550,000 in cash along with 2 million Renforth shares, plus funding additional work commitments for $4 million in exploration to advance the project. Globex also retained a Gross Metal Royalty (GMR) on Parbec, based on a sliding scale up to 2% if the price of gold held above $1200. Renforth has proven itself to be an ideal partner to advance the exploration work at Parbec. The company has completed several rounds of exploration during the tenure of the option deal, and the results have significantly expanded the established gold resources for the project. In September of 2018, Renforth reported an updated NI43-101 compliant resource estimate for Parbec documenting 37,224 ounces of gold in the Indicated category, plus another 656,875 gold ounces Inferred. The steady pace of work has continued to the present. Renforth reported another round of assay results in February 2019 for a recently completed drilling program that encountered attractive gold values including 17.55 gpt gold across an interval of 1.5 meters. This came from the Eastern extension of the deposit and demonstrates that the system remains open for further expansion. In a separate news item Renforth also reported an interval of 2 meters bearing 13.44 gpt gold from another exploration zone of the property. As the successful exploration programs have continued and the established gold resources continue to increase, the potential for development of a producing gold mine at Parbec has also increased. These factors build value for the GMR and the prospect of a payment stream based on the royalty becomes more likely. Given the outlook for continued exploration success, the two companies have agreed this week to revise the terms of their partnership. Globex reported that it has chosen to waive the remaining work commitment outstanding, and is immediately transferring 100% ownership of the property to Renforth. We understand that Renforth still had to complete $1.6 million in expenditures. With the option deal completed for the property, Globex remains leveraged to the further potential advancement of the project through its minority share ownership of Renforth, and the GMR that it holds in perpetuity. In consideration of the accelerated completion of the option, Renforth has agreed to grant Globex another 5 million shares (currently valued at $225,000), thereby expanding its ownership interest and leverage to any further success achieved at Parbec. In addition, in the event that Renforth completes a consolidation of its share capital prior to March 2023, Renforth agrees to issue a further 1,500,000 shares to Globex on a post-consolidation basis. In what may represent an even more valuable consideration, Renforth has also agreed to increase the total royalty held by Globex for the Parbec property to a fixed 3% GMR. Renforth has also committed to the payment of a one-time royalty of $1 million upon the development of a gold min and the first shipment of ore from the project. Globex has granted Renforth the right of first-refusal to purchase this GMR in the event that Globex chooses to sell its interest. Globex also amended its agreement with NSGold Corp (NSX). Under the original agreement, which dates back to 2010, NSGold acquired 100% ownership of the Mooseland Gold Property in Nova Scotia and certain secondary properties from Globex. The original agreement provided for a gross metal royalty payable to Globex in an amount equal to 4% of all metals produced from the Properties. As well, NSGold was required to issue to Globex a number of shares equal to 5% of the number of issued and outstanding shares of NSGold at the time any of the properties entered into production. NSGold and Globex have now agreed to a reduction of the gross metal royalty from 4% to 2%, the elimination of the 5% share issuance upon production. In return, NSGold will immediately issue 1,745,408 common shares to Globex. Following this issuance, NSGold will have a total of 15,708,672 common shares outstanding, of which Globex will hold approximately 11.1%. An interesting update was also issued by Globex this week, relating to a round of exploration getting underway in Quebec by Imperial Metals. With a package of property interests concentrated at the north side of Crater Lake, Imperial has completed preliminary exploration work to suggest the potential for a scandium deposit. A somewhat exotic metal with few primary production sources worldwide, scandium is a critical component involved in the manufacturing of many high-tech products and may be combined with other metals to form high-strength alloys. The presence of scandium, along with other economically attractive elements, has already been established within the holdings controlled by Imperial Metals. This prompted Globex to acquire by staking the remaining property holdings in the area, located to the south and east sides of Crater Lake. Imperial Metals will commence a 2500 meter drilling program to further validate the resource potential within the property holdings it controls on the North side. 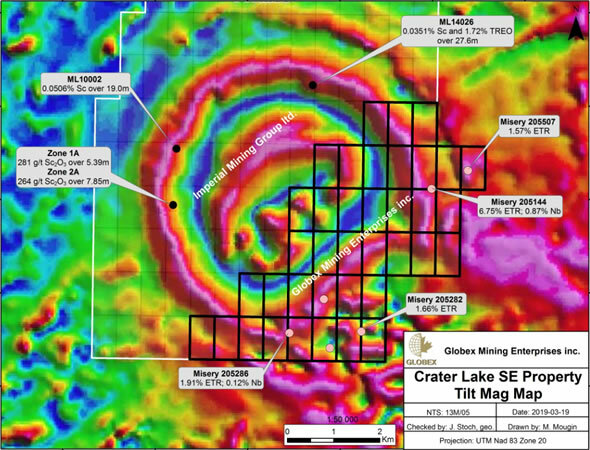 Similar structural targets have been identified within the Globex Crater Lake property interests, and highly prospective surface exploration work suggests that the ore localizing rock unit extends onto the south and east side which is covered by Globex’s claims. Pending the results of this program conducted by Imperial, the prospect of a new discovery may elevate the status for the holdings controlled by Globex, such that an exploration effort may be warranted. Geologists for Globex are thus awaiting further confirmation in the region and will proceed with greater urgency in the event that an attractive discovery is presented to the north. Knowing that Globex simply staked the property, the upside potential is substantial. Globex also reported that it has renewed its Normal Course Issuer Bid (NCIB), enabling the Company to purchase common shares on the open market. This is a strong indication of management’s believe that Globex’s shares are significantly underpriced. Up to an additional one million shares may be purchased in this program. This is the second time that the Company has been granted regulatory approval to purchase its own common stock in the market. A similar arrangement was completed last year resulting in one million shares being repurchased and subsequently cancelled. Under the terms of the NCIB, Globex may purchase up to 25% of the average daily volume during any day of trading on the TSX. This amounts to 9,182 shares that may be available for purchase on each day under the program. In addition, the Company is able to complete a block purchase involving a larger number of shares in a single transaction, once per calendar week, as long as these shares are not sold by insiders of Globex. So far, the Company has already purchased a total of 548,000 shares under the new NCIB facility. While the NCIB is an effective means to communicate to the market that the Company believes its own shares are a bargain in this price range, the ongoing structured buying of the common shares also serves to support the share price. As more shares are cancelled the share structure is also strengthened to where there are now fewer than 51.3 million shares issued and outstanding. The various updates presented by Globex serve as an indication that the Company remains focused on creating shareholder value. 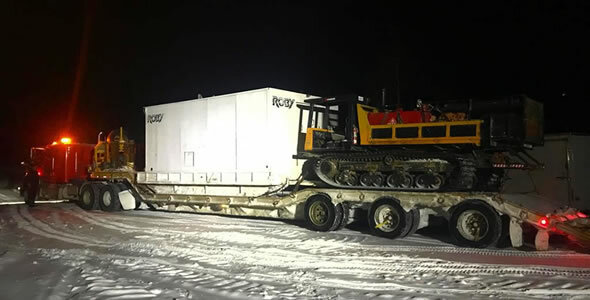 The ongoing successful exploration work at the Parbec gold property by Renforth has contributed to a much greater overall resource with a potential development scenario for a producing gold mine. This in turn has added to the intrinsic value for the GMR retained by Globex against this property. With the additional royalty leverage created through the revised terms to accelerate the completion of the Parbec option, Globex has secured a longer term potential payment stream that may amount to very significant revenues as the gold resource increases. Meanwhile the additional shares of Renforth that have been granted as part of this deal will also create value for shareholders. And the cash payments of $550,000 secured earlier in the transaction represent yet another value addition from this partnership. Ongoing work activity in proximity to the Crater Lake property may eventually contribute towards Globex establishing an exploration program in this district. This illustrates the effectiveness of the strategy to assemble a portfolio of exploration assets with leverage to numerous metals that may evolve into high-priority discovery projects, either through direct work programs, or as vended into partnerships through the project generator model. Globex shareholders may also be encouraged that the Company is working to support the share price through participation in the NCIB that will contribute additional market demand for common stock, while also tightening the share structure. The program also demonstrates the strength of the balance sheet as Globex has maintained a cash position to afford the option to pursue this strategy. Smallcaps Recommendation: BUY. Thanks for the update, good to know that Globex has already acquired 548.000 shares. The news releases are a bit overwhelming, looks like Globex is adding value every day! I’m a small investor from the Netherlands and I added some shares last weeks, now I’m a 1/2000th part owner of the company planning to stay a shareholder for at least the next 5-10 years and hoping to double my position to 0,1% when I have the money available. My price target is 1,80 CAD in 5 years, depending on higher gold prices of course.